Check out the pinned post on my FB Author Page for a chance to win one of five copies of Carolyn Haines’s CLACKING BONES that I’ll give away tomorrow. 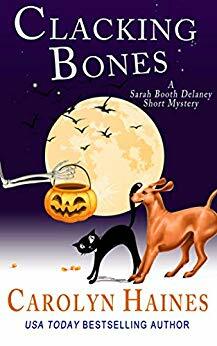 This is a fabulous Sarah Booth Delaney short mystery with a terrifically creepy Halloween feel. Love this story! If you’re ready for a Halloween read and want to win a copy, CLICK HERE! to go to my FB Author Page and leave a comment telling your favorite thing about Halloween. That’s all–do that and you’re entered. I’ll take names through tomorrow morning, and my neighbor’s granddaughter will be by to pick the winners. Be sure to Like my FB Author page if you want to receive a notification when the winners’ names are drawn. ← Previous Previous post: What’s New Wednesday?